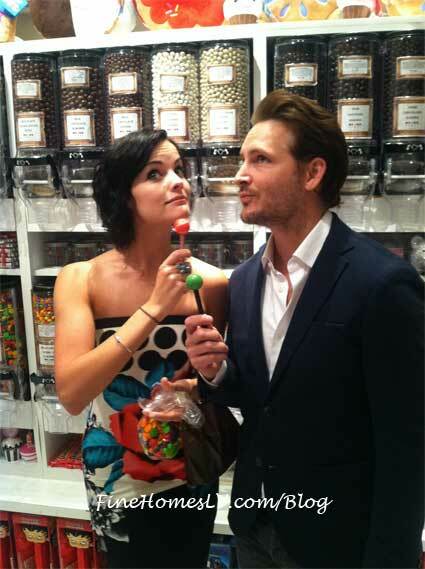 “Twilight” superstar, Peter Facinelli, and his girlfriend, Jaimie Alexander, satisfied their sweet tooth at Sugar Factory at The Mirage Casino before dining at Meatball Spot at Town Square Las Vegas tonight. The new it-couple shopped at the sweet shop to fill up on treats such as: Chewy Sprees, rock candy and Sour Patch Kids, before posing with the blinged out Sugar Factory’s signature Couture Pops. Following their visit at Sugar Factory, the lovebirds headed to Meatball Spot for lunch, where they shared delicious items from Chef Carla Pellegrino’s Italian menu. The twosome had the Baby Arugula Salad, Garbage Salad, Meatball Sampler and Veggie pizza, while stealing kisses and laughing at the Las Vegas italian restaurant.